I said last time that I was waiting for a grown-up to install my new light fittings for the Philips Hue lights, and this has now been done. This added a total of ten color & white spotlights across three rooms (living-room, office, and bedroom) and two white bulbs for the landing and hall. The result is that all the lights bar the kitchen, bathroom and spare room are now HomeKit controlled. Let’s start with the Philips Hue setup process. In theory, you screw in and power on all your bulbs before connecting up the hub and allowing it to find them all. In practice, the hub seemed to have a lot of trouble finding all 12 bulbs, so I switched to doing them one room at a time, which not only proved more reliable but also less confusing. Done a few at a time, it’s very simple. Screw in the bulbs and switch them on. Connect the hub to your router and to power. Press the button on the hub and it will go looking for the bulbs. I started with the office. In there, I have a triple-spotlight fitting, so three Hue bulbs. The hub takes a surprisingly long time to find the bulbs, which it does one at a time, so you do need to be patient. This is another good reason to do them a few at a time. You need to name the bulbs, and each one flashes to identify itself as you do so. I named them Office 1, Office 2 and Office 3. To make them controllable as a single light, I then grouped them as one light, called Office Lights. You’d imagine this would be done in the Hue app, but unless I’ve missed something, it doesn’t seem like the app can do this. This seems a pretty basic piece of functionality, especially for spotlights within a single fitting that you’ll mostly want to switch on and off together. Instead, you have to do it in Apple’s Home app. 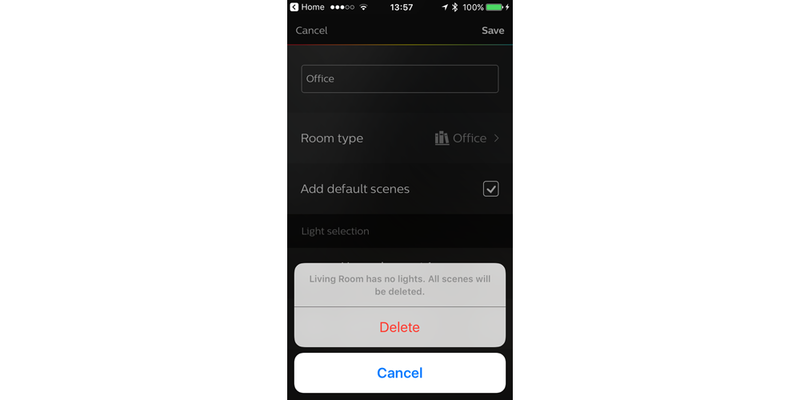 I already had Rooms set up in the Home app – Office, Living Room and Bedroom – and the Hue app is able to import these so that you can assign your Hue lights to existing rooms. This was the second area where the Hue system seemed to have trouble, initially not seeing the rooms and then – when it found them – it went into a bizarre loop. When I tried to add the three office lights to Office, it complained that Living Room had no lights and wanted to delete it. It would not allow me to save the office lights unless I allowed it to delete Living Room. When I eventually gave in and allowed it to do so, it deleted the Room not just from Hue but also from the Home app! This lost all the Scenes associated with that room, which was a major pain. When I then set up the Living Room again in the Home app, and imported it into Hue, it threatened to delete Office! I still have no idea how I eventually solved this: all I can say for sure is that it involved a great deal of going round in circles accompanied by a great deal of … verbal commentary … on the quality of the app. Eventually, all the rooms were up and running again with their shiny new Hue spotlights. This gave me three Groups: Office Lights, Living Room Lights and Stairway Lights. Each of the lights within each group is also individually controllable if desired. As with all HomeKit devices, whatever name you choose in the manufacturer’s app will be automatically imported into the Home app and also recognized by Siri. However, I did discover one oddity: Siri could change the color of my Hue lights to any color you can name … except blue! I’m sure this is just a glitch, but it happened absolutely consistently across all the lights every time I tried. You can see this in the video below. Speaking of which, here’s a video look at the new setup. Similarly, ‘Arrive Home’ switches on the hall and landing lights, and sets up the living-room – very welcoming. One disappointment, though, is that you can’t have leaving and arriving home be activated by your location unless you are using either an Apple TV or always-home iOS device as a hub. I haven’t owned a telly for 16 years, and my iPad goes almost everywhere with me, so this isn’t an option without significant additional expense. One minor change in the living-room: I hate visible wires, so the Nanoleaf Aurora cable is now hidden by a thin piece of cable ducting. I am finding that having smart bulbs requires a period of adjustment. I’ve long been switching standard lamps and reading lamps on and off with the WeMo app, so am used to this, but for other lights, my hand automatically reaches for the wall switch. There is a backup feature where if you switch the wall switch off and then on again, the bulbs will all switch on, but obviously anyone in the home leaving the wall switch off would disable them as smart lights. This means you need to think ahead when going upstairs, for example, asking Siri to switch on the hall and landing lights before leaving the living-room. I forgot several times, and was able to use my Apple Watch to get Siri to do it, but home automation doesn’t feel quite so slick when you have to pause at the bottom of the stairs to say ‘Switch on the Stairway Lights’ and wait for it to respond, rather than simply flicking the light switch right next to you! However, I also found the converse was true! More than once, I walked out of the kitchen carrying things, thinking I could switch the lights off when I was sat down and had my hands free, then realised those weren’t Hue lights. So while I initially thought it pointless having smart lights in the kitchen and bathroom, I’m now thinking that might be an, er, smart move. The issue here is that both rooms have multi-bulb spotlight fitments, so that would mean the expensive Color and White Ambiance bulbs. The two rooms together would add a cool £350. That’s crazy money for the limited benefit, but at the same time it would create an all-HomeKit home … Hmm. I also realised I had the ultimate First World Problem: my cleaner doesn’t own an iPhone. The light switches all need to be left on for the bulbs to be controllable, but she would have no way to do it. Fortunately, Philips has a solution in the form of the Hue Tap Switch. This is a physical switch with four buttons that can be programmed to do anything you like. For simplicity, given she’s only in the place for an hour or two at a time, I’ve programmed one button to switch on all the ceiling lights and another to switch them all off. It would be pretty hard to justify £50/$50 per bulb just for the convenience of Siri control, especially when I have a total of ten spotlights between three rooms. But the color bulbs of course don’t just offer simple on/off and dimming control, you can also change the colors. Using the Hue app, you can literally choose any one out of millions of colors. You can also choose from a number of built-in Scenes, that set each light to a different color, the mix giving a particular feel. You can, for example, choose things like Savanna Sunset or Spring Blossom. I must say this has limited practical application, but it is a fun way to resurface memories. When you have 16 million colors to play with, it seems a shame not to do just that – play with them. I downloaded a couple of apps that give you your own home disco. Ambify – which calls itself ‘the Hue-enabled jukebox – seemed to be highly rated, and it’s a great app. But it needs you to play music through the app. I hate being forced to play music through an app not of my choice, plus my Mac is my primary music source. I switched to Hue Disco – the results of which you saw in the video. This allows any music source, using the iPhone microphone to listen to the music. Despite this, however, it doesn’t seem to be able to detect the beat on its own: you have to tap the beat on an on-screen button. You’d obviously need to do this on a track-by-track basis, which would be tedious, but I found that if I set it to auto-change the lights at one-second intervals, that worked with most tracks. 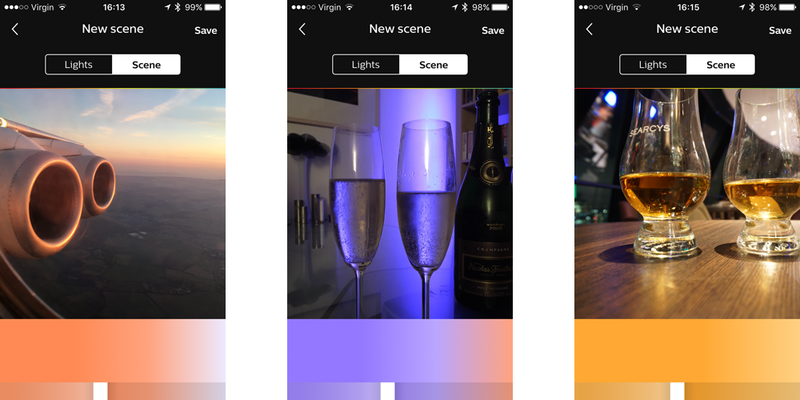 Both apps have tons of settings to play with, allowing everything from gentle transitions to rave-style strobes. Despite the name, Hue Disco isn’t just for partying. 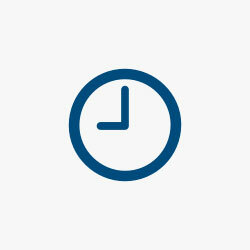 The Mood tab allows you to set transitions that range from one second to 90 minutes. There are built-in scenes – I found Sunrise and Candlelight particularly pleasing – and you can also limit the color range and maximum brightness. Some playing around got me some mood lighting that gradually changed over a ten-second period and was very relaxing. At £50 (UK) or $50 (US) per bulb, Hue is an expensive piece of tech, especially if you’re thinking of fitting out a complete home. If you’re just looking at it from a pure home automation perspective, I think it’s hard to justify the cost. But we’re not just practical people, we’re gadget lovers. Combine the gadget appeal of Siri-controlled lighting with the fun you can have with Hue apps, and I think the cost starts to look more reasonable. I’m certainly having a lot of fun! I’m not 100% certain I’m going to stick with the ceiling-mounted spotlights. Given that the financial investment here is in the bulbs rather than the light fittings, and I’m very much an indirect lighting fan, I’m considering putting dumb white lights in the ceiling fittings and then getting some standalone wall uplighters for the Hue lights. That would be additional expense, of course, but even really nice floor-standing ones cost less than the bulbs. We’ll see. As ever, please share your own setups and experiences in the comments.